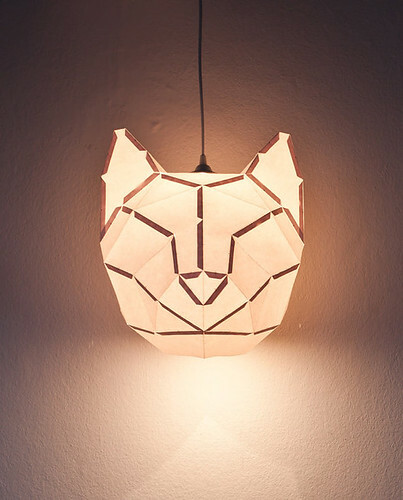 This glowing cat head from mostlikelyShop caught my eye recently - what a super Halloween decoration it would be! The shop's owners are Wolfgang List, Mark Neuner, Robert Schwarz, Maik Perfahl, and Kurt Mühlbauer of Austria, who utilize their collective knowledge of architecture and 3D computer-aided design to create intriguing objects. The neat thing about this lampshade (or not, depending on your way of thinking!) is that it arrives rolled in a tube and requires cutting, folding, and gluing. If you make one, let me know how it goes. There are three options listed at the moment - also a donkey and hand. I'm looking forward to seeing what mostlikelyShop comes up with next. Leaves are beginning to crunch underfoot and the air is crisp. Here's to a beautiful weekend where you are too! Is it weird that it reminds me of Voltron? Remember that cartoon? I wonder if that was intentional. I see what you mean... must be all the angular lines. You enjoy the weekend too, Sandy!